Kaaradaiyaan Nombu (pronounced ‘Car-a-dye-on Nomboo’) is celebrated in Tamil Nadu as the tamil month “Panguni” dawns. During this auspicious time, all married women and young girls tie a sacred yellow color thread around their neck. This is observed for their respective and prospective husband’s well being and that the couples should remain together always. 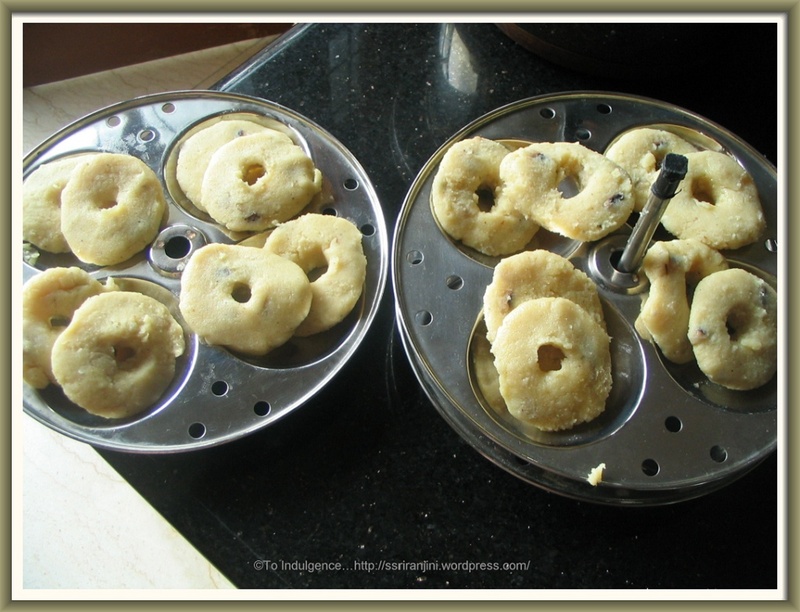 On this day, two special dishes(uppadai, vella adai) are made and offered to the Lord. One is a savory signifying Lord Siva and the other one is a sweet signifying Goddess Shakthi. This is first offered to a cow and then the women in the house break their fast by having these special dishes. This dish tastes best with butter. This dish can be served as Tiffin/Snacks. Water – For 1 cup of rice flour add 1½ cups of water. 1. 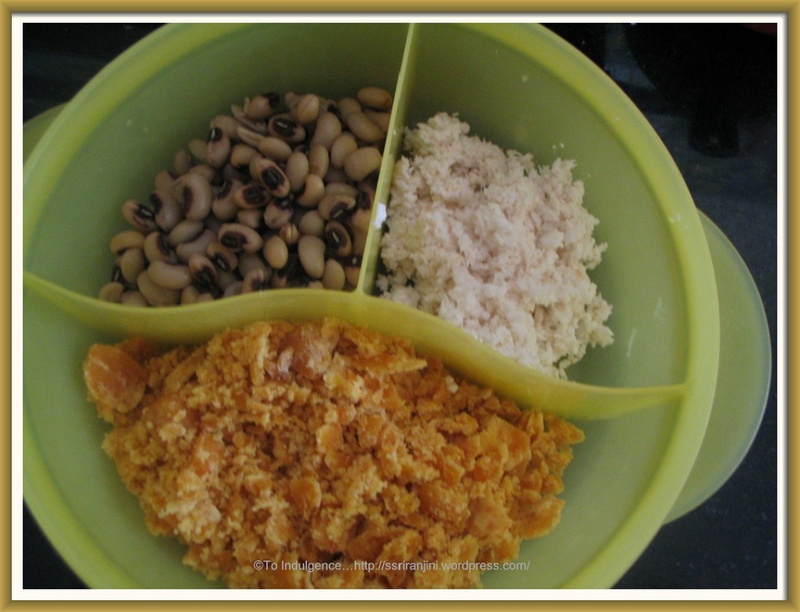 Soak the cowpeas in water for 4 to 5 hours and steam till cooked. Stain the water and keep aside. 2. Heat oil in a pan and sauté the mustard seeds and urad dal. Add the finely cut ginger, green chillies and fry for a minute. 3. Add water, salt, grated coconut, asafoetida and curry leaves and allow it to boil. 4. Simmer the heat and add the cooked cowpeas and roasted rice flour. 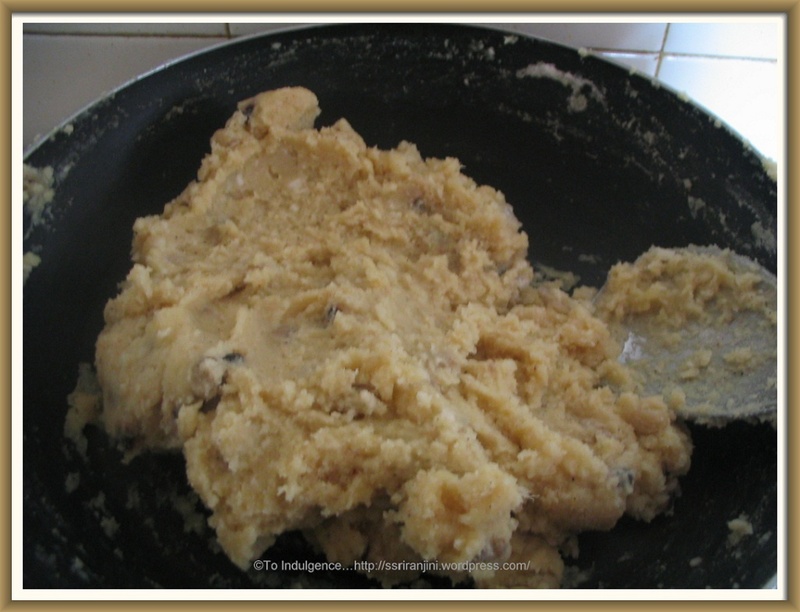 Stir constantly till the mixture comes together so that it does not form lumps. Add extra water if required. Remove from heat when all the water is absorbed and the mixture is almost cooked. 5. Take a small portion of the mixture and shape them to a circular adai (1/2 inch thickness) with a small hole in the middle on a palm or banana leaf or a plastic sheet. 6. 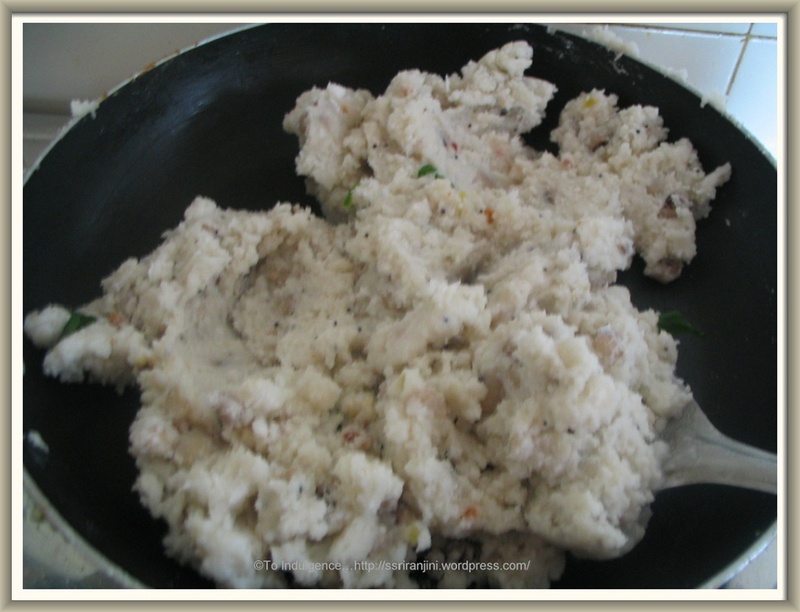 Arrange the adai in the Idli steamer or cooker and steam till cooked. Water – For 1 cup of rice flour add 2 cups of water. 2. Boil 2 cups of water in a pan. Add jaggery and allow it to boil till it dissolves completely. 3. 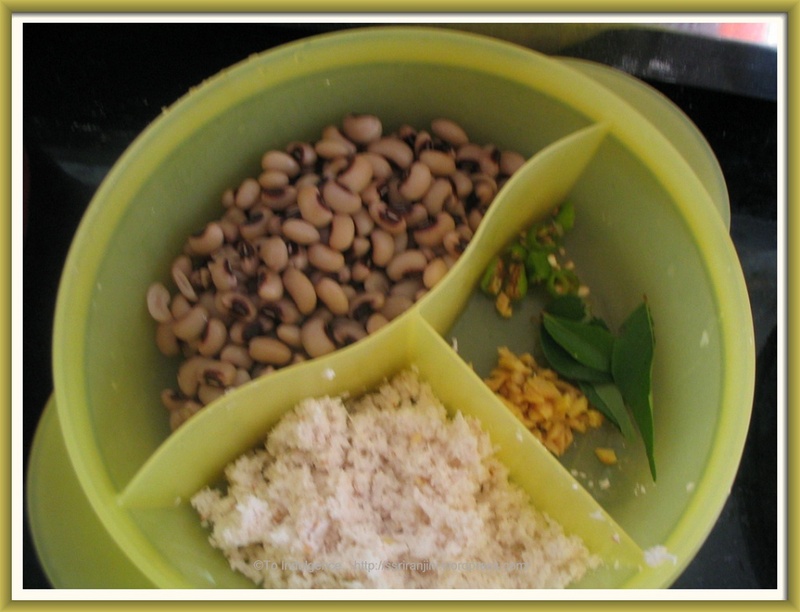 Add the grated coconut, cowpeas, crushed cardamom and roasted rice flour. Stir constantly till the mixture comes together so that it does not form lumps. Add extra water if required. Remove from heat when all the water is absorbed and the mixture is almost cooked. 4. Take a small portion of the mixture and shape them to a circular form (1/2 inch thickness) with a small hole in the middle on a palm or banana leaf or a plastic sheet. 5. 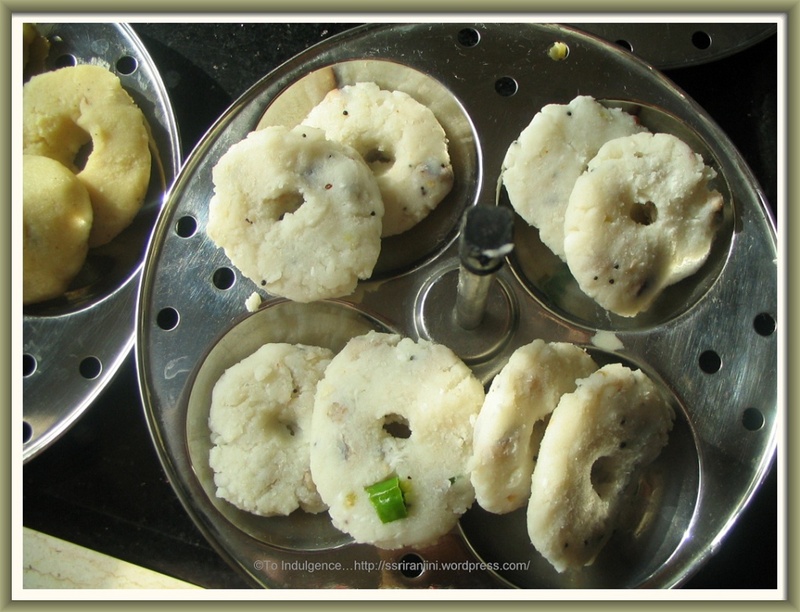 Arrange the adai in the Idli steamer or cooker and steam till cooked.